2) Never let your defenses get more than 2 levels behind the max of your current level - If you're a BH5, upgrade your defenses to level 4 BEFORE you pull the trigger on that BH6 upgrade. There might be a little wiggle room there on defenses like the MultiMortar or AirBombs, but not much. 3) Max 1 or 2 attack strategies at each level before moving up - To win PvP battles, you've simply got to be able to attack. The Matchmaker on the BB is based on trophies; not the level to which your game has been developed. That means you'll be matched against stronger, more developed players (especially if you rush) so you have to be strong enough to attack. A player at BH7 with level 8 troops is going to find it tough going. 4) Listen to others...don't think they preach the holy word - You need to play the game at a pace that matches your skills and makes it fun for you. This is a game, after all, and who wants to play a game that's not fun? If you want to near max by taking all of your defenses to max...go ahead and do it. You'll certainly be a stronger defender at the next BH level. If you want to upgrade the moment you have everything down and enough gold to do so...go for it. In both cases, though, set realistic expectations for the game so you're not disappointed. That said, there are some very specific things you'll want to do/not do while rushing on the BB. 1) Max thru BH3 - The first three BH levels are just silly easy. If you max them as you go, it will take an extra day but it actually works out well. 2) At BH4, max your defenses and key troops; ignore support structures like the Clock Tower and Gem Mine. Support structures offer something for your opponent to hammer on while your defenses shoot his troops; they don't offer much value otherwise in the game so upgrading them can be put off to later. 3) Keep storages not more than ONE level behind your BH and always upgrade one to the current max as soon as you can. You can get all the way to BH5 on your level 3 storages, but you'll need level 4 storages right away and a single level 5 storage a week or so into BH5. 4) Tempting though it may be, do not upgrade to the next BH level until you've completed the basic upgrades mentioned above. That means upgrading all defenses to 1 level lower than your current BH level and maxing your key troops. 5) If you REALLY want to "get there faster", you can go to BH7 with level 3 AirBombs, Crushers, and MultiMortar. You'll lose more matches than players who take level 4 of these structures to BH7 and you'll need to prioritize their upgrade when you get to BH7. 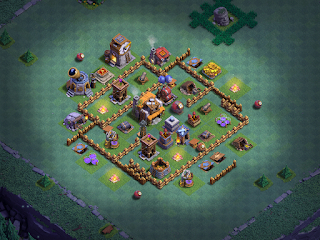 6) Trophy push early - BH2 and BH3 is the perfect time to set your base trophy ranking when rushing. I push BH2 to around 600-700 trophies, then BH3 I get up over 1000 trophies. That way, I make enough daily loot to finance upgrades without having to wait between days. 7) Avoid the hyper-rush unless you're an experienced player. My Phoenix Abyss game is a hyper-rushed game; it is a BH7 and has a mix of level 2, 3, and 4 defenses. This game has been a bit of a pain to play - certainly not fun. If it were my main game, I'd have long since quit. Anyone who knows me knows that I'm a huge proponent of rushing - I've argued in favor of it for years on the forums. I'm an even bigger fan of having fun. Pace yourself and enjoy the game! Now, there's one other type of rushing worthy of note - that's hyper-rushing. Hyper-rushing is very straightforward - you literally upgrade the absolute minimum necessary to reach the next level of the game, then you upgrade your BH - lather, rinse, repeat. In this case, I only upgraded one troop as a key troop then moved on. For the first 3 levels of the game, that was a duo of the Sneaky Archer and Raged Barbarian. At BH4, though, I switched gears and maxed Beta Minions. They've been my key troop ever since, all the way through to where the game sits right now at BH7. The hyper-rush is as valid a form of play as any other. Just be sure to set realistic expectations - you won't magically rise to max loot over night and your win:loss ratio will be a bit lower. Each game was developed with a specific rushing style and upgrade path in mind. As you go through them, you'll see how each is following a slightly different upgrade order as well. In each case, I tend to stick to my above stated principles for rushing. Of course, the one exception is the Phoenix Abyss game, which is an experiment in hyper-rushing. Even there, though, it's catching up to the regularly rushed games as well. Today's companion video is online at the following link. Thanks for reading; head on over to the video for a like and a subscribe!